Released in early June, the Marketo Email Editor 2.0 offers both exciting features and some drawbacks. RightWave recommends cautious adoption. Simple editing of pre-headers and the text version of emails. For more information on pre-headers and the importance of text versions for wearable technology, see the RightWave blog Email Reigns. Marketo API does not yet work with the new editor. Once the 2.0 Editor is enabled, any Draft 1.0 template that is approved will become an Email 2.0 version and cannot be changed back to Email 1.0. The Text version does not support variables. Videos do not work in older versions of Outlook. 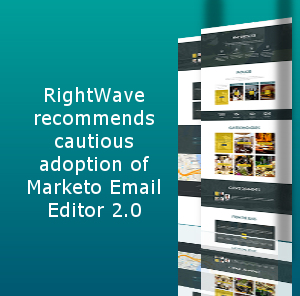 For those organizations that rely heavily on the Marketo API, RightWave recommends delaying Email 2.0 implementation. Review and approve/reject all changes queued for email templates and incorporate the approved changes. Review all the active emails with custom coding and prepare a checklist. Ensure that all personnel are thoroughly trained on the behavior of Email 2.0 before implementation is begun. As admin user, click Email Editor Settings and select ‘New’. Check Enable Marketo Starter Templates and click Save. RightWave is delighted to provide its customers with more details on the features, drawbacks, and implementation steps, and can assist in the process. For information on becoming a RightWave customer, visit our Contact Us webpage.